Our community based experiential learning (CBEL) project focuses on addressing food insecurity issues faced by families living in social housing in Richmond, BC. Working alongside the Richmond Food Security Society (RFSS), our team developed a survey that would allow data to be collected on the current food security status of a specific social housing community. We based this survey on the United States Department of Agriculture (USDA) Household Food Security Survey Module (HFSSM), along with support from other relevant journal articles. After gathering and compiling preliminary data we developed the research question: “What is the best method of designing a survey module, to determine the level of Food Security or Insecurity within a family household in a social housing unit?” In order to answer this question, a systematic literature review was conducted. We investigated the contents of four databases using the keywords ("food security" OR "food insecurity") AND ("survey" OR “methodology”). We further narrowed our search by limiting to English-language, scholarly peer-reviewed journal articles from the year 2000 onwards, and from this obtained a total of 3,298 hits. After thorough analysis of 265 abstracts each group member chose an article to examine. By having each of our eight group members review an article, we were able to reduce individual biases in selection of resources. From the eight chosen articles, we were able to determine which survey methodology was most effective and relevant to our research question. Overall, our results showed that a cross-sectional survey design correlates to a higher response rate among households. However, the limitations of our research include the inability to apply a study to a general community, along with potential respondent bias and low response rates from surveys. We would recommend that follow-up interviews be conducted to gather more qualitative data and initiate dialogue with the social housing residents. To conclude, we based our survey methodology off of our systematic literature review findings, and have designed a cross-sectional survey that aims to measure the level of food security for Richmond families living in a social housing community. We have been working on a Community-Based Experiential Learning project to assess the level of food security for social housing residents in Richmond, BC. The RFSS ensures the safety, security and availability of food in Richmond. Their mandate states that "all people in the community, at all times, have access to nutritious, safe, personally acceptable and culturally appropriate foods, produced in ways that are environmentally sound and socially just" (Richmond Food Security Society, n.d.). Within the community food system, the RFSS represents a community support system which collaborates with educators and researchers, and provides for the community food system by improving access, food equity, land use, and education. A link to our interpretation of how the RFSS fits into the community food system can be found here. Richmond has a population of approximately 200,000 people (City of Richmond, 2014a). According to Statistics Canada, in 2006 the number of households with incomes below the Low Income Cut-off (LICO) rates were about 20% (City of Richmond, 2014b). Research links low incomes with increased demands for community services and reduced health status (City of Richmond, 2014b; Canadian Community Health Survey, 2014). The high cost of living in Richmond can be a barrier to food security, evident in the fact that the Richmond Food Bank is used by over 1,500 individuals per week (Richmond Food Bank Society, 2014). Families receiving social assistance are known to face a higher risk of living in poverty (Raphael, 2012), and in Canada, at least half of these families reported relying on community food services for support (Pegg & Stapleton, 2013). As part of our collaboration with the RFSS we were asked to create a survey to assess the level of food security for families living in social/subsidized housing within Richmond. We developed a research question to focus our goals: "What is the best method of designing a survey module, to determine the level of Food Security or Insecurity within a family household in a social housing unit?" With this question as a guide, we began the process of investigating the most effective survey methods that would allow our survey to achieve a high response rate and yield statistically valid data, in the most logical, unbiased, and ethical fashion possible. 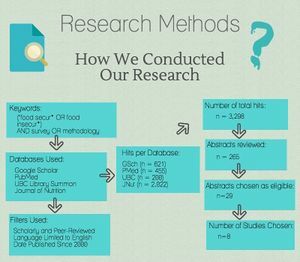 To carry out our research, we conducted a systematic literature review. A literature review is a synthesis of research findings presented in a concise format. The process involved searching various databases to find articles containing relevant topics and research methods. We then filtered those findings to come to a conclusion that would help answer our research question. Our literature review is “systematic” due to how we minimized bias in the search and selection of individual studies to include in our report (Schlosser, 2007). (“food secur*” OR “food insecur*”) AND survey OR methodology. The central topic of our study addresses food security, therefore we included both food security and food insecurity as potential terms within studies. To ensure we received a combination of results, we linked specific terms with the Boolean operator ‘OR’ (Library Research Skills for Land and Food Systems, 2014a). We assigned the truncation ‘*’ to include possible variations on words, such as food secure or food security (Library Research Skills, 2014b). We added the Boolean operator ‘AND’ in order to exclude results which did not contain all keywords (Library Research Skills, 2014a). We developed a more succinct search by adding filters of “Scholarly and Peer-Reviewed” as well as limiting the language to English. We selected papers that conducted research within North America to ensure they would be most applicable to our survey. We also refined our search to select papers that specifically conducted research in low income families or households. Finally, our searches were limited to literature journals that had been published since 2000 to ensure relevancy. If this criteria was met, it allowed us to choose which abstracts to investigate further. The searches that were conducted provided us with a total of 3,298 hits. The largest number of hits were generated by Journal of Nutrition (n=2,022), followed by Google Scholar (n=621), PubMed (n=455), and lastly UBC Summon (n=200) (Table 1). Twenty-nine abstracts were chosen, based on the inclusion criteria. From these, each member chose the article they found to be most applicable to our research question, thus determining our final eight articles used for in-depth review (Table 2). Of the eight articles chosen, 62.5% used a cross-sectional sample design, and 25% were literature reviews focusing on the strengths and limitations of specific analytical methods used to measure food security. Lastly, one article (12.5%) applied a longitudinal sample design. Further examination showed that 50% of our findings applied the Household Food Security Survey Module (HFSSM), developed by the United States Department of Agriculture (USDA). Studies that used the HFSSM had response rates in the range of 60-77% (Table 3). Table 1: Scholarly database search results based on key search terms and filter criteria. Selection process narrowed results from 3,298 total hits to 8 relevant articles chosen for in-depth review. Table 2: Final journal articles chosen for full review, based on inclusion criteria and search filters. n=8. Table 3: Comparison of data found through analysis of final 8 journal articles. Analysis involved a summary of survey subjects, sample design, response rate, and survey tool. 2) Regional health assessment survey "COMPASS NOW 2012"
The majority of articles used a cross-sectional study design. This means that these studies were used to collect data about one variable within a given population at one time (Levin, 2006). This aligns with the food security assessment survey we have developed, as the survey would be distributed to a specific community at a specific point in time. 50% of the analysed studies followed or modified the USDA’s Household Food Security Survey Module (HFSSM) (Table 3). The studies which used the HFSSM were found to have had higher response rates (Table 3). We also modified this survey model because it provided a framework of general indicators that might suggest a household is suffering from food insecurity. As well, the module is easily adaptable; this was important for our survey because the survey was meant to be developed for a specific demographic (i.e., low income families living in Richmond). From the article findings shown in Table 3, we critically evaluated each of the 8 articles to find the most suitable one to use as a reference for our survey design. We based our survey design on the paper “Housing Circumstances are Associated with Household Food Access among Low-Income Urban Families,” by Kirkpatrick and Tarasuk (2011). This article contained parameters most similar to our research question, which relates to the food security issues in affordable housing communities, and the HFSSM was used. Additionally, the sample population is based in North America, which is applicable to our proposed sample community of Richmond, BC. Table 4: Example of questions that could be asked in a survey, with examples of what respondents would have the option to choose. These questions are formatted in a tone where statements of “Often true” indicate status of being food insecure (Health Canada, 2012). The evaluation of survey responses is to be based off of resources such as Health Canada’s 2012 Guidelines to Determining Food Security Status, or the Statistics Canada Low-Income Threshold 2013 data, among others (Appendix, 6.3). The majority of studies which were analysed also factored in low-income status of households as a strong indicator of food insecurity. According to the Canadian Community Health Survey, household food insecurity is “closely linked” to household income (Statistics Canada, 2014). Therefore, we have decided to include a question in the survey about income, in order to better classify a household as low-income/food insecure (Appendix, 6.3), based on Metro Vancouver's Low-Income Cut-Offs (Statistics Canada, 2011). The significance of our findings can be applied in the greater context of combating food insecurity, especially for those living in government subsidized housing. For example, Loopstra and Tarasuk (2013) found that changes to the economic status within households reflects changes in a household’s “food insecurity scale score”. The researchers add that “a lack of protection from negative changes” could perpetuate negative circumstances for households that experience declines in income and employment. Essentially, our survey may be able to identify those who are food insecure, those who are not, and why. If our survey is distributed in conjunction with in-person interviews, both quantitative and qualitative data could be extrapolated to identify specific programs that may be made available to assist families in achieving food security in a social housing setting. Our survey is limited as it is developed for a specific organization (RFSS) targeting a specific community, which is not necessarily applicable to all low-income families from different demographics. Therefore, there is no "perfect" survey which can be distributed to assess food security, as each population differs in the type of questions that can be asked or are deemed appropriate to ask. However, as mentioned earlier, the HFSSM generalized format that we have used can be easily adapted to many contexts, allowing some consistency for the measurement of food security. Another challenge is determining at which level food security exists (i.e., what is the cutoff?). There is no universal cutoff that will work for all situations (Jones, 2013). We found that though the definition of food security is clear, it is a topic that is very subjective based on the context in which it is used. This depends on how one interprets food security. To clarify, any given household is going to interpret food security differently based on what they consider to be personally or culturally appropriate foods (Jones, 2013). Also, as with most distributed surveys, much limitation exists in people’s tendency to not return the survey, thus lowering response rates. When surveys are returned, potential respondent biases must be considered. A respondent may over- or under-exaggerate their lived experiences. Furthermore, some household-based surveys are “flawed by recall errors, biases, and choice of survey instrument" (Beegle et al. 2012), as well as more specific problems related to food consumed outside the home, wastage and storage, and food given to animals, employed labourers or guests (Bouis et al. 1992; Bouis 1994; Sibrian 2008; Smith and Subandoro 2007)” (as cited in Heady and Ecker 2013, p. 329). This will alter the conclusiveness of whether or not this household is food secure and to what extent. We suggest distributing the survey by cross-sectional design. Although we have provided a sample survey that can be used by a team working on a similar project in the coming years, we suggest considering the following questions to determine whether the tool we have created is what best fits their specific project goals, as per Jones, 2013. After answering these questions, the individuals using our survey may find that it requires slight changes to be used for their demographic. 1. What components of food security do you intend to measure? 2. Who will use your data and what type of data will be most useful to them? 3. What is the purpose of the data? 4. What is the periodicity to be evaluated? 5. What resources are available for planning, data collection, analysis, and the intended application of the findings? We recommend conducting follow up interviews with stakeholder approval, to gain more qualitative data (for example, coping methods that have been applied to deal with food insecurity). This is because interviews can be used to investigate issues in-depth, add a human dimension to impersonal data, and help to further explain the statistical data from the questionnaire. As our survey was constructed based on literature to create the most effective survey module, we recommend next year's students execute their project based on our findings. In conclusion, we think our survey is an adequate tool for the RFSS to assess the level of food security within a social housing unit. By conducting a systematic literature review, we aimed to be as unbiased as possible in selecting the articles from which we gathered data. All the selected articles have similar parameters to our research topic, which allowed us to extract useful information regarding efficient methods to assess the household food security level in social housing units. Our research permitted us to make comparisons between articles and short-list those that displayed efficient survey methods (e.g., high response rate). Our team has created a final survey that, if distributed, we believe will elucidate key information on the level of food security for families living within social housing in Richmond. Please note that text in italics is explanatory, and will not be included in the distributed survey. 1. Where do you most often obtain food for your household? Please check all options that apply. This question is qualitative data, relating to Q2 which pertains to food security. As such, it cannot be quantified in the analysis of food security response measurement, but may be used as an analytical tool for comparisons of similarities between food sources for food insecure households once all surveys have been returned and data is being analysed. 2. How easy is it to obtain food for your household from the locations you mentioned in the last question? Please check one. This question quantifies the accessibility of food for the household. This is based on the World Health Organization food security definition of “having reliable access” (World Food Summit, 1996). We wanted to evaluate the accessibility of food for the household in a simple manner, therefore limited the answers to three options. A household for which food is not easily accessible is to be classified as food insecure. This question quantifies the proportion of household income allocated to food. We based it off the study by Kirkpatrick & Tarasuk (2011) who also measured food expenditures for 30 days prior to the survey. These values were then compared to an estimated cost of a nutritious diet. We simplified the question and the analysis by providing three options. A household that spends more than half of it’s monthly expenses on food is to be classified as food insecure. 4. Please read the following statements, and determine whether they were often true, sometimes true, or never true for your household over the last 12 months? Please choose one response for each statement. These questions quantify household food security on a basis of income and expenses. The questions are formatted such that statements of “Often true” indicate food insecurity. This portion of the survey is directly based off of the USDA Household Food Security Survey Module (2012), with minor adaptations we felt would clarify the question being asked and eliminate redundancy. The following question responses are judged based on Health Canada’s 2012 guidelines to determining Food Security Status (see Response Analysis table, section 6.4 in Appendix). 5. Do you, or anyone in your household, regularly use food support programs? These programs include food banks, community kitchens, subsidized school lunch programs, etc. This question quantifies the reliance of households on subsidized food or food support programs. According to the 2009 study by Kirkpatrick and Tarasuk, the odds of using food banks and other food support programs were higher in food-insecure families. 6a. If you answered yes, how easy is it to access these programs? Please check one. By “accessible” we mean: how easy is it for you to gain information about these programs? To directly participate in these programs? To gain transport to and from the locations of these programs? etc. This question also addresses the accessibility of subsidized food or food support programs, similarly related to the World Food Summit (1996) definition of food security. A household which replies in the previous question that they use these support programs, but for which this answer is “not at all accessible”, shows a household that has developed coping mechanisms to be able to access such programs. It would be of interest to have a personal interview with this household to ask questions about the types of programs they participate in and their strategies to deal with food access. 6b. If you answered no, why are you not able to access these programs? Please check all that apply. This question is to provide qualitative data about the reasoning behind the lack of participation in food support programs. The analysis of responses may be of interest to future survey distributors. If you answered “no” to Question 5, please move on to Question 8. 7. Do the food support programs offer you, or members of your household, choices for your personal dietary needs or preferences? This includes dietary restrictions such as vegetarian, Halal, Celiac disease, etc. This question addresses the acceptability of subsidized food or food support programs. As stated by Koc et al. (1999), the parameters of food security extend to the four A’s: availability, accessibility, acceptability and adequacy. For example, a household may be restricted to only consuming culturally acceptable food, which according to Koc et al. is that which is produced and obtained in ways that are not compromising to the dignity, self-respect or human rights of the consumer. 8. Which of the following have been problem areas or barriers for your household when it comes to getting food in the past 12 months? Please check all that apply. This question provides qualitative data which pertains to barriers to food security. As such, it may be used as an analytical tool for comparisons of similarities between barriers for food insecure households once all surveys have been returned and data is being analysed. 9. Please state the number of people currently living in your household. This question relates to Q10 for determining family size, as well as the number of people requiring food and shelter within the household. 10. Do you have any children or dependents currently under your care? If so, how many? This question determines family size as well as eligibility criteria for whether survey respondent’s household is classified as a “family” household. 11. Do you, or does anyone in your household, suffer from any long-term dietary diseases or food restrictions? Examples include Celiac disease, Diabetes mellitus, Irritable Bowel Syndrome, high cholesterol, etc. This question is associated with household susceptibility to food insecurity and/or challenges associated with food security and access to suitable foods. May be linked to Q3, Q7, and Q8 for discussion if survey results are correlated and significant. Through our research we found literature supporting the statement that food insecurity is linked to chronic disease among low-income households, and may lead to the development of chronic disease (Seligman, 2010; Laraia, 2013; Terrell, 2009). 12. What is the rough annual income of your household after taxes? According to the Canadian Community Health Survey (2014), household food insecurity is closely linked to household income. where y = minimum income required to classify as “low-income”, x = number of people in family, and $14,544 is the value obtained from the minimum value for a one person household minus the 5,829 constant. Note to future survey distributors: Finding out from the housing developer the mean or median monthly rental cost per unit can provide data to extrapolate to the proportion of household income that is spent on housing costs, which can be comparatively analysed with Q3. Dachner, N., Laurie, R., Kirkpatrick, S. and Tarasuk, V. (2010). Food Purchasing and Food Insecurity Among Low-Income Families in Toronto. Canadian Journal of Dietetic Practice and Research/Revue Canadienne De La Pratique Et De La Recherche En Diététique (71)3, e50 - e56. doi:10.3148/71.3.2010.e50. Kirkpatrick, S. and Tarasuk, V. (2009). Food Insecurity and Participation in Community Food Programs among Low-income Toronto Families. Can. J. Public Health, 100(2), 135-139. Retrieved from http://www.csd-i.org/storage/ol-201-course-documents/Food%20Insecurity%20and%20Participation%20in%20Community%20Food%20Programs.pdf. Kirkpatrick, S. and Tarasuk, V. (2011). Housing Circumstances are Associated with Household Food Access among Low-Income Urban Families. J. Urban Health, 88(2), 284-296. Retrieved from http://link.springer.com/article/10.1007/s11524-010-9535-4#page-1. Koc, M., MacRae, R., Mougeot, L., and Welsh, J. (Eds.). (1999). For Hunger Proof Cities: Sustainable Urban Food Systems. Ottawa: International Development Research Centre. Laraia, B. (2013). Food Insecurity and Chronic Disease. Advances In Nutrition: An International Review Journal, 4, 203-212. Library Research Skills for Land and Food Systems. (2014a). Module 2B.04 Combining Concepts. Retrieved 27 November, 2014 from https://connect.ubc.ca/webapps/portal/frameset.jsp?tab_tab_group_id=_2_1&url=%2Fwebapps%2Fblackboard%2Fexecute%2Flauncher%3Ftype%3DCourse%26id%3D_59160_1%26url%3D. Library Research Skills for Land and Food Systems. (2014b). Module 2B.05 Truncation. Retrieved 27 November, 2014 from https://connect.ubc.ca/webapps/portal/frameset.jsp?tab_tab_group_id=_2_1&url=%2Fwebapps%2Fblackboard%2Fexecute%2Flauncher%3Ftype%3DCourse%26id%3D_59160_1%26url%3D. Loopstra, R. and Tarasuk, V. (2013). Severity of Household Food Insecurity Is Sensitive to Change in Household Income and Employment Status among Low-Income Families. J. Nutr., 143(8), 1316-1323. Retrieved from http://jn.nutrition.org/content/early/2013/06/12/jn.113.175414. Pegg, S., & Stapleton, D. (2013). HungerCount 2013: a comprehensive report on hunger and food bank use in Canada, and recommendations for change. Toronto, Ont. : Food Banks Canada. Raphael, D. (2011). Poverty in Canada: Implications for health and quality of life (2nd ed.). Toronto: Canadian Scholars’ Press Inc.
Seligman, H., Laraia, B., & Kushel, M. (2010). Food Insecurity Is Associated with Chronic Disease among Low-Income NHANES Participants. J. Nut., 140(2), 304-310. Statistics Canada. (2014). Canadian Community Health Survey - Annual Component (CCHS). Retrieved 23 November, 2014 from http://www23.statcan.gc.ca/imdb/p2SV.pl?Function=getSurvey&SDDS=3226. Terrell, A., & Drew, C. (2009). Is food insecurity associated with chronic disease and chronic disease control? Ethnicity and Disease, 19, 3-6. Tolzman, C., Rooney, B., Duquette, D., and Rees, K. (2014). Perceived Barriers to Accessing Adequate Nutrition Among Food Insecure Households Within a Food Desert. Wisconsin Medical Journal, 113(4), 139-143. Retrieved from https://www.wisconsinmedicalsociety.org/_WMS/publications/wmj/pdf/113/4/139.pdf. World Food Summit. (1996). Rome Declaration on World Food Security. Retrieved 23 November, 2014 from http://www.fao.org/docrep/003/w3613e/w3613e00.htm. This page was last edited on 30 November 2015, at 19:57.